La Maison Jolie: Murphy & Daughters Travel Candles: The Perfect Companion On Your Next Adventure! Murphy & Daughters Travel Candles: The Perfect Companion On Your Next Adventure! I have no clue who invented the concept of travel candles, however, the idea is brilliant and that person is a genius! What a novel idea to take your favourite scented candle with you wherever you go since it comes encased in its very own tin caddy with a safe screw-on cap. The perfect travel companion on your next adventure or impromptu weekend getaway! 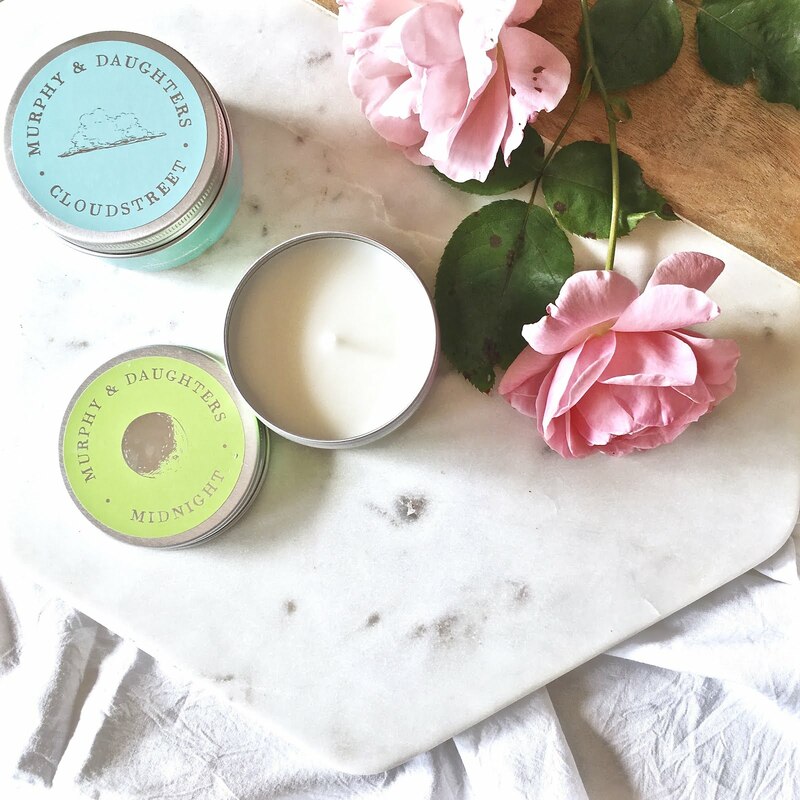 Recently, I had the opportunity to try out a couple of travel candles - cloudstreet and midnight, named after popular book titles. The candles came in pretty coloured containers of aqua and lime green and on opening the tins, the wafting fragrance was powerful and absolutely delicious! Cloudstreet has complex and strong tones of orange blossom, lemon, mandarin, jasmine, green tea, honeysuckle, bergamot, pear and musk. When you smell this candle you can understand why less is not more, more is more! To a layman like me, this candle smells fresh and delicious like sunshine in a tin and evokes images of running free through an orangerie. Midnight on the other hand has more delicate notes of bergamot, blackcurrant, pink grapefruit, green tea, lily of the valley, rose and jasmine. The delicate scents in an intricate balance creates a unique aroma. I can't quite tell if it smells completely floral or fruity...but the combination of these fragrances smell very exotic and transcendent! These hand poured travel candles are made with a pure vegetable soy wax and use a cotton wick making them an eco-friendly option. Every burn session is as aromatic and sensational as the last. And the little sketches of the clouds and the dark moon on the caps add a pretty whimsical touch. After all, it's all in the details! For an RRP of $19.00 AUD (100g) with a 15-20 hour burn time, these extremely handy size travel tin candles are worth taking on your next impromptu weekend away or getting them as a gift for the traveller in the family. Or burn these gorgeous candles in your home or office to simply treat yourself! There are five delightful fragrances to choose from - Cloudstreet, Tender Night, Secret Garden, Midnight and Wild Things. Available from Murphy & Daughters. Till next time...which scent will you choose? This post was in partnership with Murphy and Daughters but as always all words, thoughts, opinions and emotions are mine. I only ever endorse products that I think are genuinely amazing and I love and would personally use. Thank you so much for supporting the brands that support this blog.